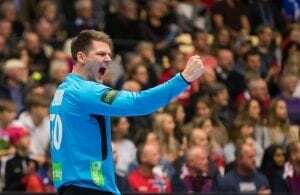 Home / News / IHF / Norway becomes Olympic Champion (W) !! Norway becomes Olympic Champion (W) !! Norway is the Olympic Champion in Women’s Competition! They have beat the Montenegrin squad with 26-23, and the most important factor was Linn Jorum Sulland – scoring 10 goals for the Norwegians. Having small lead throughout the whole game, and from time to time the closest the Montenegrins could do get a draw but failing to capitalize sometime never took the lead and this cost them dear. Bulatovic led Montenegro with 10 goals, while Popovic had 5 goals. In the Norwegian squad, Sulland had 10 and Alstad scored 5. Next Story → From Beijing to London – Norway is the BEST! Damn Referees should receive gold medal. They’ve totally earned it for Norway. The stunt they did in front of 2 Billion spectators at Olympic Final game was something that person with at least minimum morale integrity wouldn’t do. what a shame!!! montenegro deserved a gold medal! !montenegro-moral winner! Heroic play with two players less. In fact with four players less, because the sisters were playing for Norway. It was OG final game and not some 3-rd grade league match. Believed that there should be some justice in OG Finals but it seams that Justice got expelled by Bonavetura sisters. At least u could c in that match how to make proper 4-0 defensive zone. The refrees brought Norway the gold. They should be punished, it’s a disgrace. The Bonaventura sister the lowest form of life. No way, heroes are france refrees. Shame.